A short trip to Hawaii yielded a couple of interesting finds. 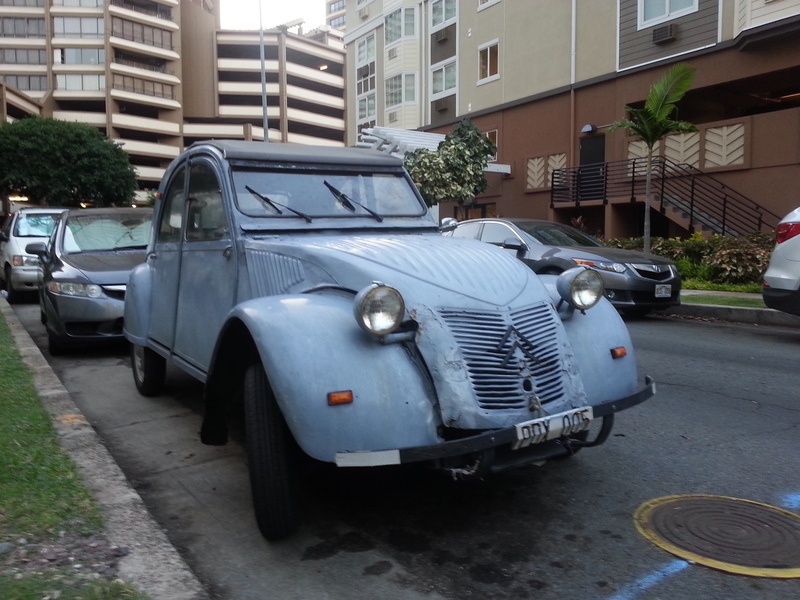 Evidently, the climate and distance from the mainland does not get in every enthusiast’s way of enjoying older cars. Beyond what’s captured below, some older American cars, a pair of Pinzgauers, a beater Beetle convertible and a mid-1970s Porsche 911S in running but rusty condition were pleasant surprises among all the rental Jeeps. 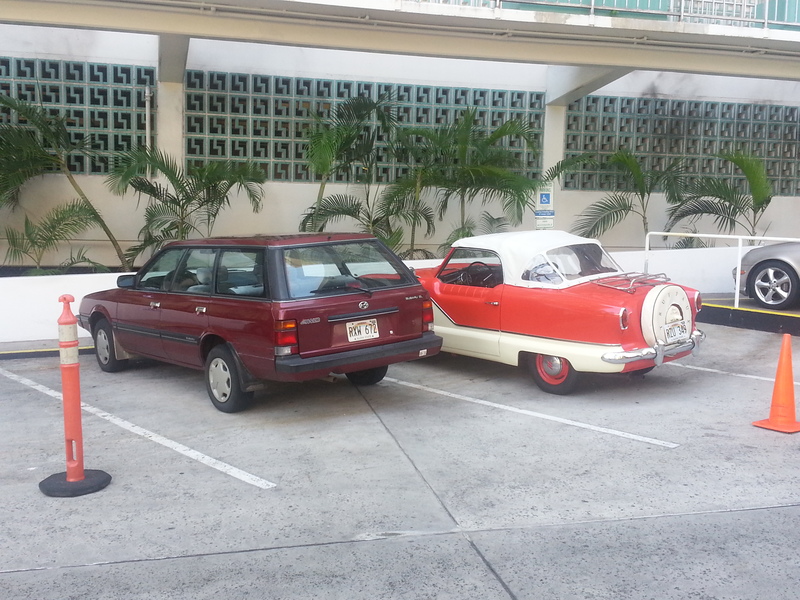 The first find was this unusual pair – a Nash Metropolitan which was promoting a business next to a Subaru Loyale. The Subaru must have been a recent arrival from the mainland since it was in immaculate shape. This Citroen 2CV was truly unexpected, and was clearly someone’s driver, strung together with their best brush-painting and hardware store parts. No less cool for that, this is also an early ripple bonnet car, built from 1949-1960. So they’ve kept it alive on the city streets for that long – no mean feat given the humid, salty climate and the durability of 55+ year-old sheet metal. The owner clearly uses the car as it was intended, as the back seat is full of various bits and pieces. 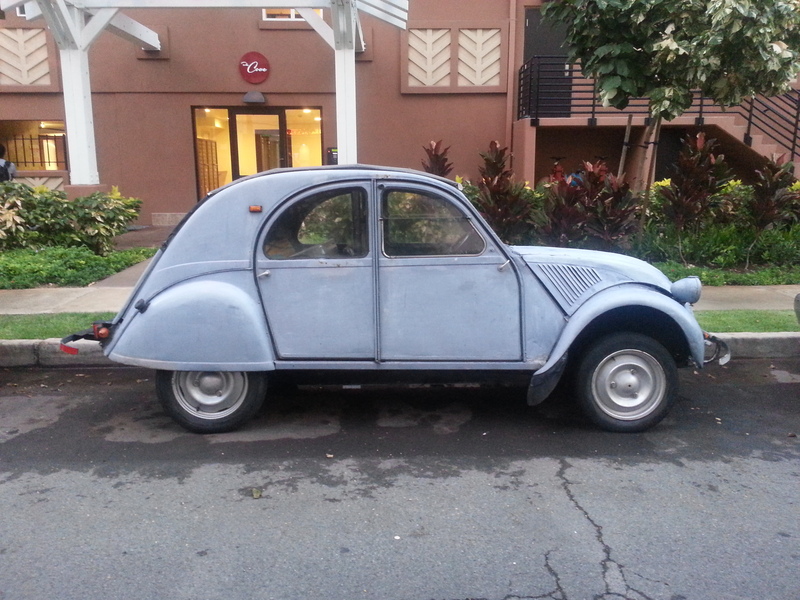 Other cues of an early 2CV include the solid c-pillar with indicator light, and vented hood. Amazingly, while the car looked battered, it didn’t appear to have much in the way of rust or filler. What cars have you seen in a place you’d least expect it? This entry was posted on October 17, 2015 at 8:13 am and is filed under RustyButTrusty on the Street. You can follow any responses to this entry through the RSS 2.0 feed. You can leave a response, or trackback from your own site.